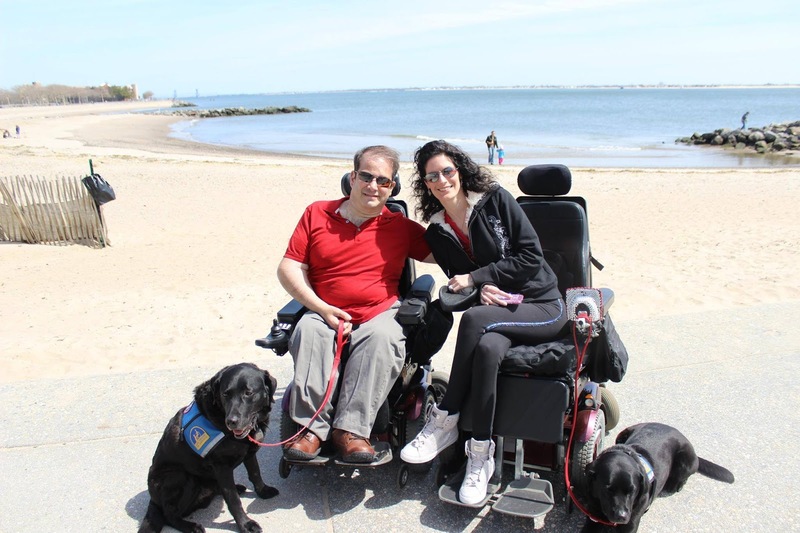 When I stopped walking due to rare conditions that continue to stump doctors to this day, I had no idea how my life would change. 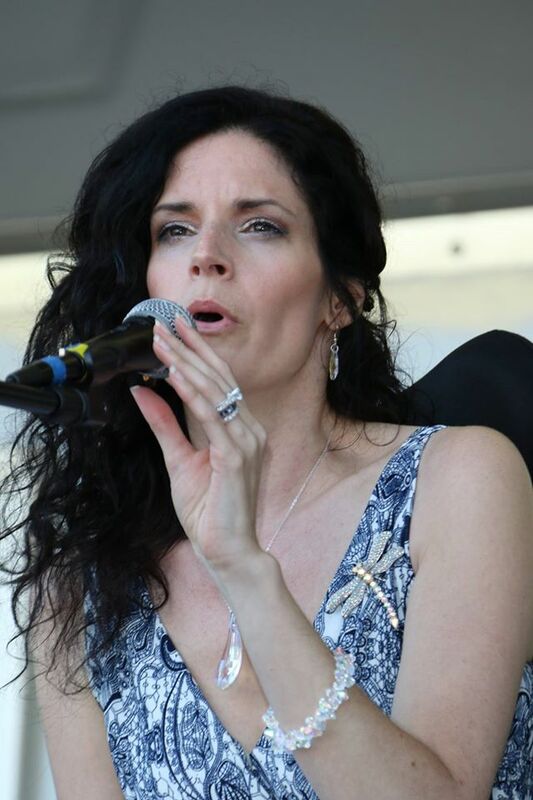 After working and singing professionally and living a completely independent life, I went to stand, hit the ground, and never stood up again. My paraplegia diagnosis came about 10 years ago on October 31st. After all the brain surgeries, diagnoses and needing caregivers to help me with ADL's, I thought nobody would ever be interested in dating me. I opened up my mind, though, to dating a man in a chair. I hadn't done that yet. I met Frank through Judy, a woman who raises puppies for Canine Companions for Independence (CCI). It took some time for me to adjust, as we are both disabled, but he was patient and gave me time. Frank had Bastien, a service dog through Canine Companions for Independence, and I had Carmel from the same organization. We had disability, service dogs and a very strong foundation of friendship that grew with time. I love laughing, and we have a similiar sense of humor, the same values and a strong belief and love of God and keeping Him first in our lives. I heard about CCI through a friend, Marlene, when I was in a nursing home for six months. I looked into the organization and believed so strongly that this was something I was supposed to do with my life. I believed the dog would change my life, and I would meet someone through CCI, and that's exactly what happened. Before Carmel, going out in public was always an experience. First, people saw the chair and not me. They felt sorry for me and told me so directly: "It's such a shame because you're so pretty." I understood that there was a compliment in there, but it is just so wrong on so many levels. "People don't know what to say," I've been told. Then how about saying nothing? I could've gotten through that day much better without hearing that! Once I received Carmel, the circumstances shifted. Now it was about my beautiful lab and what she does for me. How does she help me, what does she do for me on a daily basis? I happily explain every time I'm out. Then, I had a boyfriend with his dog, Bastien, myself and Carmel. When WE went out, we were quite the image! Getting out of the van, people would literally stop and watch us get out and roll into a store. Frank understood what it was like to be in a chair, as well all the obstacles that go along with it. When something happens to my chair, he has fixed it. He understands me in ways no able-bodied man can or has. Nine months into our relationship, Frank took me into the city and at an amazing dinner said, "Beautiful, will you marry me?" We then had the usual experience of trying to find a venue that was accessible for us and our friends. After months of searching, we found the perfect venue, The New Hyde Park Inn. Settling into married life went smoothly. Carmel and Bastien got along well and everything was moving along. We did demos and speeches as to how these dogs have changed our lives. They come to us when we graduate with 44 commands. They also teach us in our team training class of 12 days how to train the dogs to do specific tasks that we need. I've taught Carmel 20 more. Our beloved Bastien got very sick and he prevailed once, but the second bout, he just wouldn't eat. We made the heart-wrenching decision that all animal parents hate to make. But we knew it was best for him, and we know we'll see him again. About a month ago, CCI paired Frank with Drew, a yellow lab who is a funny, loving boy who will lick your face until you laugh. In fact, we've named the command "facial." I knew that CCI would change my life, and it has. I couldn't have imagined how my life would change in these last ten years. I'm singing again, which was something I wasn't sure would happen. I'm thrilled to have Frank, Carmel and Drew in my life. 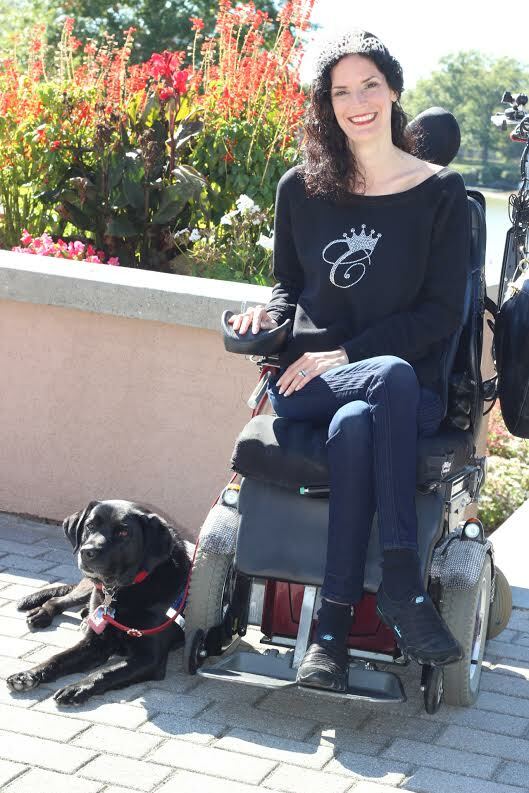 I ran for Ms Wheelchair NY USA and am honored to be a title holder. My platform is "Service Dogs: Changing Lives One Wag At A Time." 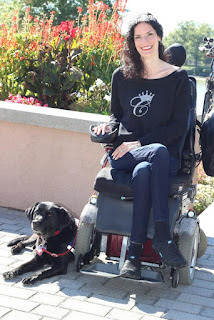 I have the thrill and opportunity to go across NY state explaining and demonstrating what Carmel does for me, what the ADA says about service dogs, and much more. I'm so grateful for the way my life has changed and grown. I believe it has now come full circle. 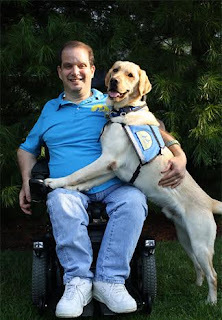 Canine Companions for Independence changed my life in so many ways, but most specifically those changes have names: Frank, Carmel, Bastien and now Drew. Full disclosure: I am biased - Emily is my cousin, but with that said I have to let everyone know what a beautifully written article this is. But not just that. Knowing Emily on a personal basis has always been such a blessing. She is a true inspiration to all who know her and I love her to pieces! Keep on keepin' on, Em - you are doing a great work and your contributions to everyone you come in contact with are so valuable.